About 7,500 light-years from our planet there’s a pretty awesome star system inside a beautiful nebula called Eta Carinae. But despite the distance, we’re still feeling its effects. In the mid-19th century, this system suddenly became the second brightest star in the sky. Once thought to have been a supernova, we now think this was the result of the stars blowing off a huge amount of material – making it a bit of a “supernova imposter”, and leaving behind the Homunculus Nebula. Sometimes called the Great Eruption, the exact cause of that event isn’t clear. But now a new study published in Nature Astronomy using NASA’s NuSTAR space telescope has found the system is still firing out particles at high energies, and some are reaching us as cosmic rays. “We know the blast waves of exploded stars can accelerate cosmic ray particles to speeds comparable to that of light, an incredible energy boost,” said Kenji Hamaguchi, an astrophysicist at NASA’s Goddard Space Flight Center in Greenbelt, Maryland, and the lead author of the study, in a statement. Cosmic rays are known to hit our planet from beyond the Solar System, but their electrical charge means they fly off course when they hit a magnetic field, making tracking their origins difficult. NuSTAR, however, was able to pinpoint some of the radiation coming from this system to our own. 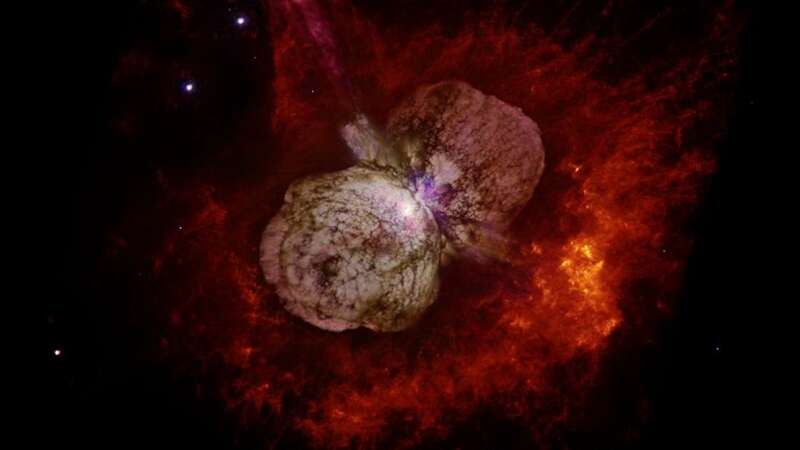 Eta Carinae consists of two huge stars, 90 and 30 times the mass of the Sun. And every 5.5 years they pass extremely close to each other, just 225 million kilometers (140 million miles) apart – comparable to the distance from Mars to the Sun. The stars emit powerful stellar winds like our Sun, but when they approach each other these winds clash together, producing a noticeable X-ray signal that was spotted by NuSTAR. Researchers also saw a burst of gamma rays using NASA’s Fermi Gamma-ray Space Telescope. Interestingly, however, this orbital process can’t explain everything. NuSTAR observed some X-rays that were three times more energetic than those believed to be produced by the colliding winds. These seemed to sync up with when the gamma rays are emitted. And then, those electrons make it out of the system, and all the way to Earth. So who’d have thought it – a pair of dancing stars thousands of light-years away are sending just a little bit of their love this way.